Interior of lakeside pavilion on Lake Murray, SC. 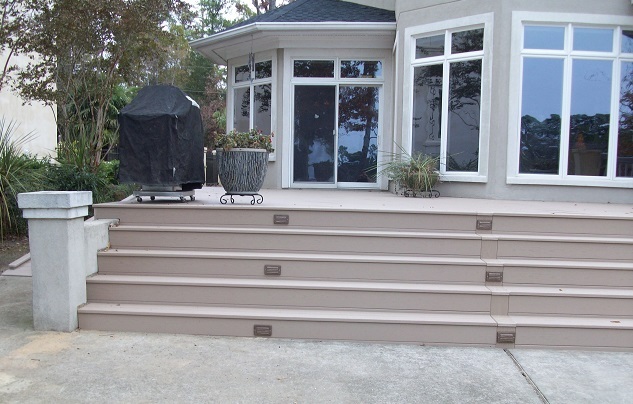 Archadeck of Central South Carolina just completed a terrific project for a homeowner residing on beautiful Lake Murray. We started with only an existing concrete patio, a roof and an outdoor fireplace that offered stunning views of the water, but no protection from insects and changing weather conditions. The family’s goal was to create an inviting space that could be used year round so they could take advantage of entertaining with friends at any time. It was important to the homeowner that the outdoor feel be maintained with the new design so that hanging out in the space still had the feeling like everyone inside was on vacation and not feeling like they were stuck indoors. They were going after an airy, open resort-type mood so that it felt very much like a getaway. Before Archadeck of Central SC began the transformation of this space. 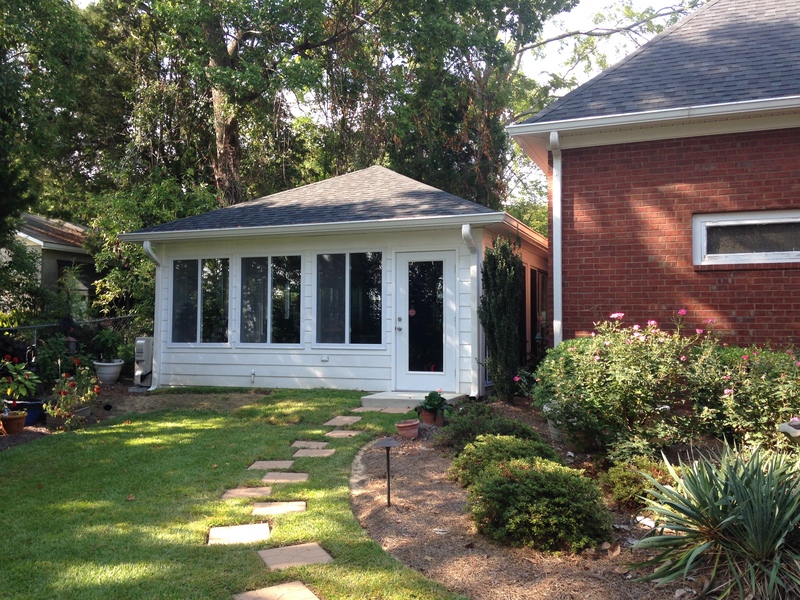 We were able to work with the existing structure to save the client a bunch of money. We simply added walls, doors and sliding glass windows to create the vibe and feeling of an outdoor room while everything is protected inside so that it safeguards from harsh weather and nasty biting critters. Everyone can enjoy dining, relaxing, and even watching TV from the big screen mounted above the fireplace’s mantel (and hidden behind doors so that it can’t be seen when not in use). 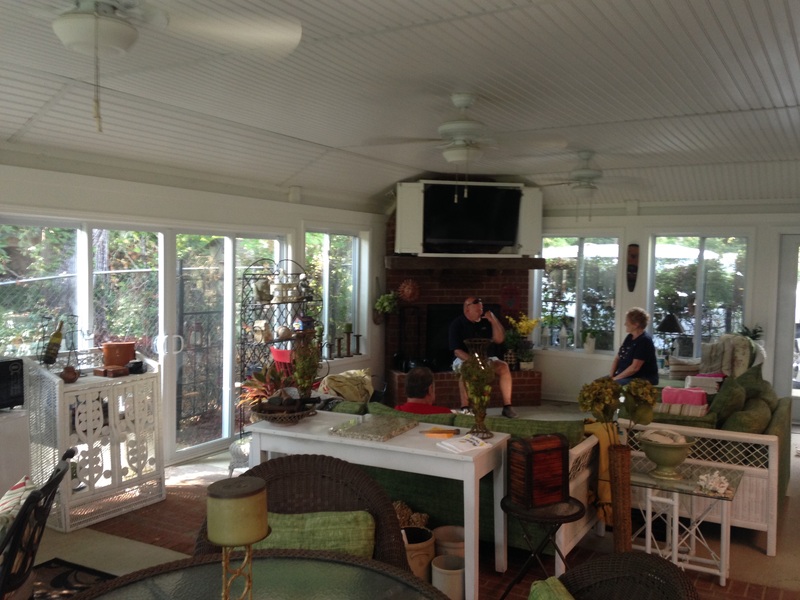 The owners wanted the equivalent of a lakeside living room, and that’s what Archadeck of Central South Carolina gave them. The expanse of low-maintenance vinyl windows does not hide the views of the surrounding trees, landscape and lake. On beautiful days the windows slide open to take advantage of the cool breezes and sounds of outdoor wildlife. Even if the weather gets wet or wild, the family can sit nestled inside while still enjoying the outdoor feeling thanks to all the glass. There is tons of room for seating inside in separate zones all within the same space. 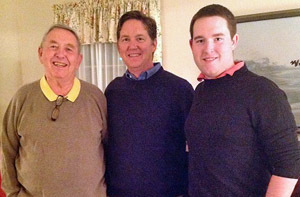 Lots of guests can be simultaneously dining, playing board games or relaxing on the couch watching the ball game. It’s also the perfect spot for a big party when celebration time arises. Completed pavilion on Lake Murray, SC. Interior of completed pavilion on Lake Murray, SC. The entire structure is made of materials that require minimal upkeep so the family can enjoy their time in their new outdoor room instead of maintaining it. It also fits perfectly into the landscape and is in a similar style to the neighboring homes so that it blends beautifully into the area. If you’ve got a space you’d like to enclose for extended year-round use as a three or four season room (or want a brand new one built from scratch), give Archadeck of Central SC a call today at (803) 603-2160 or via email at centralsc@archadeck.net. This entry was posted in Custom Garden Structures and Detached Outdoor Rooms, Custom Outdoor Living Designer & Builder, Freestanding Porches, Outdoor fireplace and fire pits, Outdoor Living, Outdoor Rooms, Porches and tagged Archadeck of Central SC, Archadeck of Central South Carolina, Central SC outdoor rooms, Central SC outdoor structure experts, Central SC porch builder, Columbia Sc Covered Patio Builder, Lake Murray patio to outdoor room conversion, Lake Murray SC outdoor strcuture builder, Making your Columbia SC dream backyard a reality, Outdoor living spaces on Lake Murray SC on October 13, 2015 by archadeckofcentralsc. Our recent redecking project on Lake Murray in Lexington, SC. One of our recently completed projects takes us to lovely Lake Murray in Lexington, SC. These homeowners not only have a stunning home, they also have the view to go along with it. 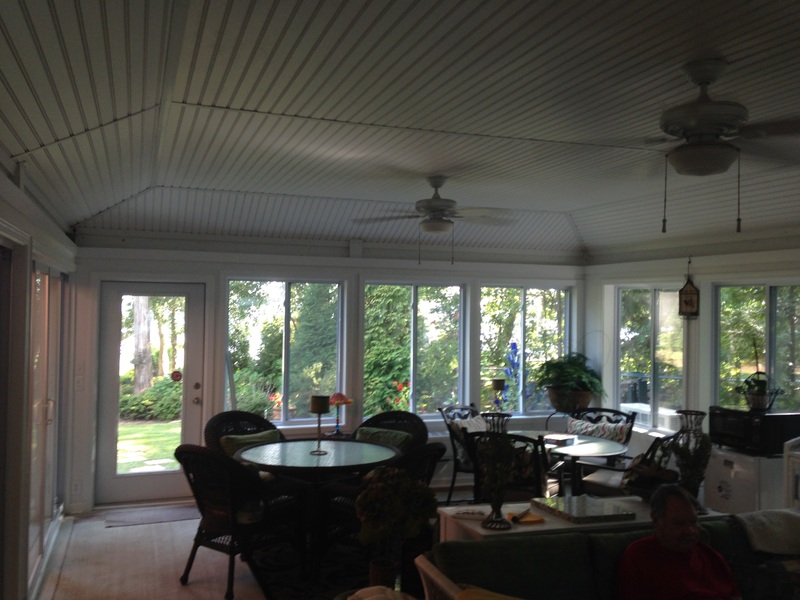 Their large deck and covered porch spans almost the entire rear of their home and offers views of the lake. These homeowners contacted Archadeck of Central SC to upgrade their aging wooden deck with a low-maintenance decking material. Their goal was to have an outdoor living space that not only looked elegant but could afford them more time for enjoyment rather than the chore of maintaining it. 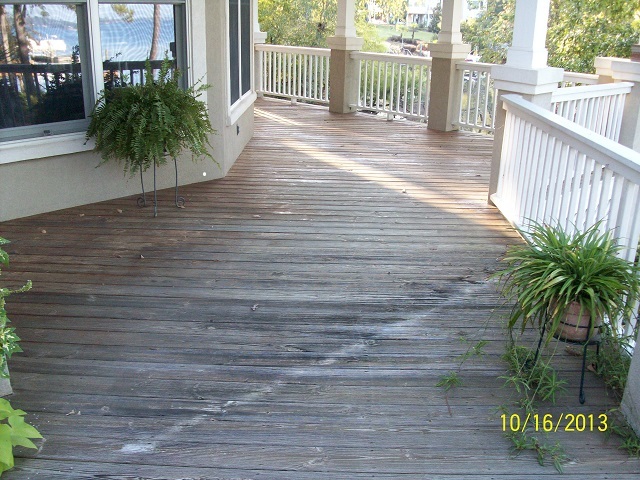 Before: This image shows the tired wooden deck prior to beginning the redecking. The homeowners chose beautiful AZEK PVC decking in Brownstone for the redecking project. AZEK decking boards are engineered to withstand the everyday accidents that can happen on a deck.This material resists spilled wine, fruit punch and hamburger grease and is ultra stain resistant. AZEK decking boards are scratch resistant so there is no worry about marks from patio furniture or pets. In addition, this material is impervious to mold, mildew and insects providing the perfect setting for carefree outdoor living. After: Here is an image of that same area after we completed redecking with AZEK. In order to accommodate the change from a pressure treated wood surface to synthetic, Archadeck of Central SC added supports to handle characterisics of the new decking. 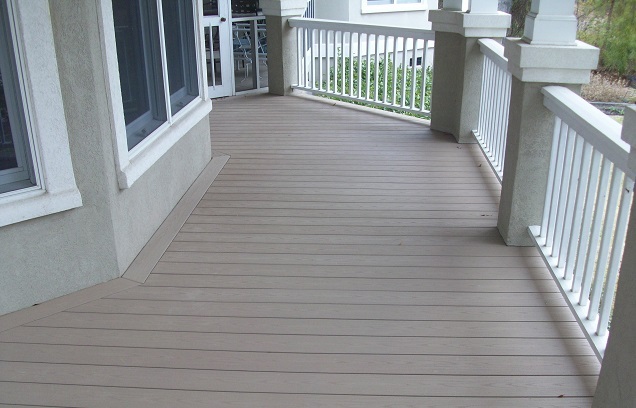 Often, low-maintenance decking boards are installed using hidden fasteners, as well, which requires additional amendments be made to the structure of the deck to ensure there is ample structural reinforcement for proper installation. Beautiful redeck on Lake Murray in Lexington, SC. 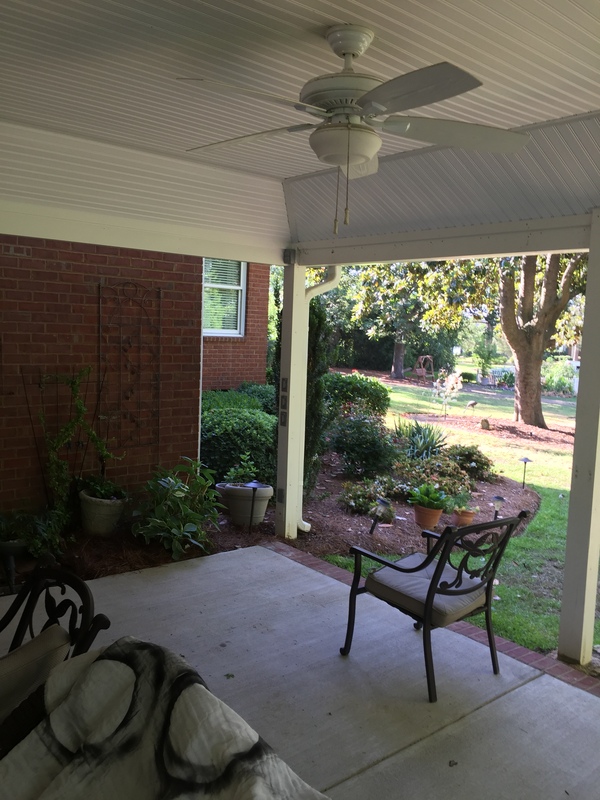 This project also included making some changes to the footprint of the existing deck and covered porch for both cosmetic and functional reasons. Since the home’s facade is stucco, our redecking experts carefully cut around the areas of the new deck that make contact with the home. We did this to ensure the integrity of the stucco as well as that of the decking boards. Instead of installing the new decking boards in a traditional pattern, we installed them on a diagonal with a parting board to create visual interest.The final touch to the project was the addition of low-voltage deck lighting on the risers to enhance safety and promote ambiance when the homeowners are enjoying the deck in the evening. 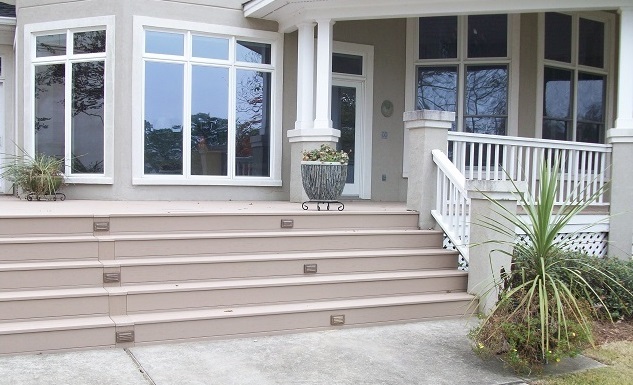 The homeowners chose PVC decking in Brownstone, from the Harvest Collection by AZEK. The homeowners couldn’t be more pleased with the redecking project.They are looking forward to enjoying the benefits of outdoor living for many years to come with less focus on maintenance and more on enjoying the lovely view from their deck and covered porch. 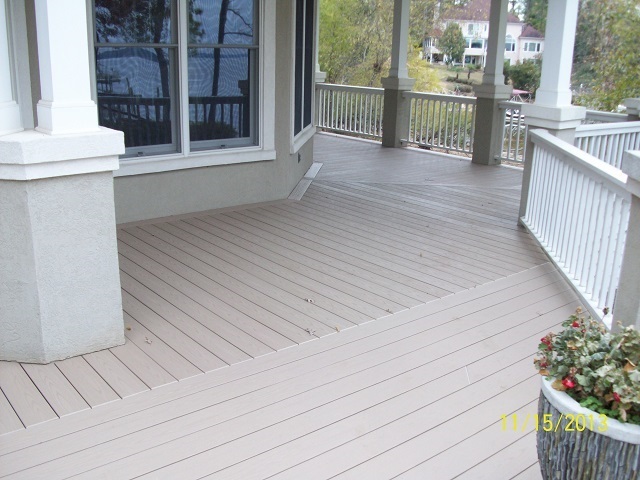 Please visit our decks photo gallery and our composite and vinyl (PVC) deck photo gallery located on our website for more examples of lovely low-maintenance redecking and new deck designs by Archadeck of Central SC. This entry was posted in Decks, Lakefront and lakeside decks, Lakeside outdoor structure designs, Low Maintenance Decks, Quality Redecking and tagged Archadeck of Central SC, Archadeck of Central South Carolina, AZEK, AZEK PVC decking, Beautiful decks on Lake Murray in Lexington SC, Central SC combination outdoor living spaces, Central SC composite deck builder, Central SC composite decks, Central SC deck builder, Central SC deck designs, Central SC decks, Central SC synthetic deck builder, Central SC Synthetic decks, Choosing the right low maintenance material for your Columbia SC deck, Columbia SC AZEK deck builder, Columbia SC AZEK decks, Lake Murray SC Deck Builder, Lexington SC AZEK decks, Lexington SC AZEK redecking, Lexington SC lakefront outdoor structure designs, Outdoor living spaces on Lake Murray SC on March 31, 2014 by archadeckofcentralsc.